Dec 31 Have a SH!OK (WOW, YUMMY, & AAHH) New Year! Happy New Year from Hong Kong! May you have a delicious year ahead! Let us celebrate this occasion with the extremely delicious and authentic Singaporean meal my sister decided to have as her last meal in Hong Kong before she left for the U.S.. Behold! SH!OK located on the most slanted road in Central. We literally almost rolled down the street trying to get in and out of the restaurant. 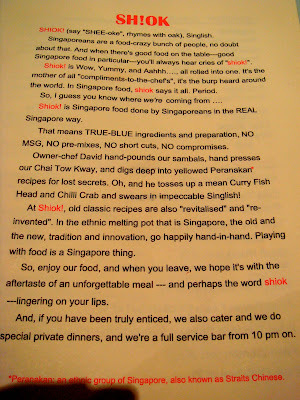 Pronounced "SHEE-oke" like their menu says, is a Singlish (Singaporean & English) combination of wow, yummy, and Aahh... all rolled into one! And boy was this place yummy. It was definitely the way my sister wanted to be sent off with her home Singaporean food. You could tell this place was legit just by walking through the door. Everyone had awesome Singaporean accents. If you don't know how that sounds like you are definitely missing out... just add LA to the end of every word you say. It's quite awesome. First up was their Black Chai Tow Kway, which is carrot/radish cake with sweet soy sauce (Box 1). You can choose between white or black. Black is way better! Second was Otak Otak, which is spicy fish paste wrapped in a coconut leaf and grilled (Box 2). Next was our order of Chili Shrimp Paste Fried Rice (Box 3) and our Deep Fried Pork Chop (Box 4). 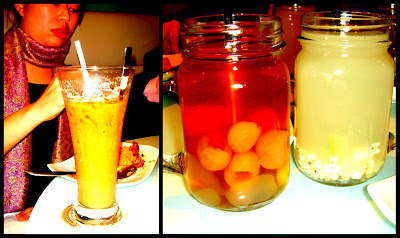 The Singaporean drinks we decided to go with were Singaporean coffee (Box 1), Fresh Hot Longan juice, and Hot Barley Water (Box 2). FYI-Barley Water is supposed to do wonders for you beauty wise! This is a very popular dish pronounced "Ba good dei". It's basically spare rib soup with herbs. 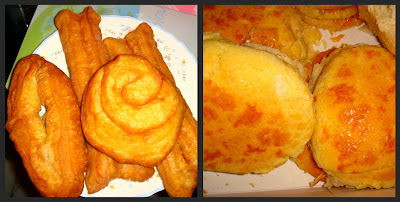 You are supposed to eat it with you tiao or yau ja gwai. You can see a piece in my bowl (Box 2). 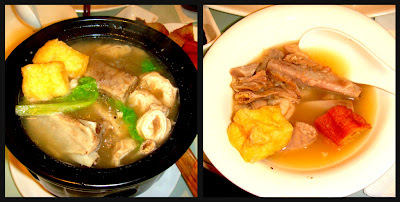 Yau ja gwai (油炸鬼) is usually used to dip with soy milk for breakfast or with Chinese porridge (Box 1). It's basically a Chinese donut literally meaning "oil-fried devil." According to legend, its name came from a high ranking official who tried to give away Chinese land to the Barbarians. The villagers used a rope to bind the official and his wife together just like how the donut is made as two foot-long rolls of dough joined along the middle, with one roll representing the husband and the other the wife. The youtiao is deep fried and eaten as if done to the traitorous couple. Box 2 is a picture of pineapple bread which is also sold at the same places you tiao is sold. It doesn't taste like pineapple, rather sugary coat of goodness at the top looks like that of a pineapple. Next 2 dishes were Singaporean style Wonton Noodles (Box 1) and Stew Assorted Vegetables (Box 2) for Grandma who doesn't eat spicy food. Box 3 is my favorite Stingray dish, which was pretty good. FYI, the best stingray I've had was actually on the side of the street in Malaysia. And just as we were ready for our check, the owner decided to have a chat with us. He was super nice and was so happy that we enjoyed every single dish. Apparently we also became new BFFs since the owner decided to throw in a free order of Seri Kaya for us (Box 4). According to him, Seri Kaya was once very popular among prominent Singaporean families in the 1950's but has since disappeared because of how much work it takes to make it. It takes 2 hours of constant stirring to make! Unlike the normal Kaya texture, this kind was like a custard. It was so delicious that my sister had to buy some with toast to go for her flight! 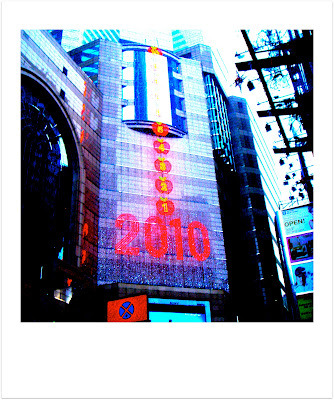 Happy Eatings and Have a SH!OK 2010! We will definitely be back to this place in the coming year! Jan 1 Have a SWEET New Year!